In 1996, Jack Hough was trying to figure out which restaurants to place where in a somewhat limited space at the North Georgia Premium Outlets mall. "It was our first outlet, and space for everything was an issue," says the Alabama native. "So I said, 'Why can't we run nine separate concepts out of the same kitchen with one GM?' A few of my franchise friends had a fit because it had never been done before, but after I explained that it would not interfere with their menus and concepts, we were able to get it done." Over the years, Hough has extended that consolidated food court model into 14 airports, outlet malls, universities, and other "non-traditional" settings across 12 states. Today his company, MSE Branded Foods, represents more than a dozen national franchise brands, including Arby's, Sbarro, Subway, Steak 'n Shake, and signature concepts such as JJ's Sports Bar & Grill and the Buckhead Grill. When Hough explains how all his brands work together, he makes it sound simple. He says the cooking and presentation of most of his brands are done ahead of time. "The only thing we have in the kitchen is prep. That really streamlines things," he says. "If I brought in a concept with a kitchen in the back room, that could be problematic, but we have operated licensed Chick-fil-A units in a consolidated format by making accommodations in the kitchen." When considering additional brands, Hough says that instead of looking at the hot, new concepts, "We decide what type of food we need for a particular location. Each of our locations is different. Even if we're talking about regional airports, we can be talking about one that is business-focused and another that's a tourist airport. We select concepts based on what we perceive consumer demand to be." Another factor that makes this model so successful is that restaurants in airports and malls have a built-in clientele. "We don't have to generate customers through special marketing. They are generated for us," says Hough. The same is true at universities, where students supply a steady stream of customers. Nearly 20 years after his first consolidated food court model, however, everyone's gotten in on the action. "Every location we look at, we're competing with somebody. You win some and you lose some. If you look at nine or 10 locations, you may end up with one or two," Hough says. His company, based in Gainesville, Ga., must remain nimble, he says. For example, since 9/11, MSE employees who work in the six regional airports must undergo TSA background checks and wear special identification badges. MSE, which has found its niche--created it in fact--strives to maintain the quality of the franchised product, says Hough. "Everything runs so the brand integrity is protected, but behind the line is a shared functionality. The various brands share sinks, coolers, prep space, and dishwashing facilities." In addition to his franchised brands, Hough is especially proud of his signature brands. For example, Buckhead Grill specializes in top-quality Black Angus beef burgers. "We must have tested 40 different suppliers to come up with the best burger on the market," he says. I've worked since I was 11--paper routes, Western Union, and in a bakery between college semesters. In any business, you must have the ability to read and understand financials. My nine years in banking gave me great insight into how to run a business. I sit back and look at the number of concepts we run and the geographical spread, and I wonder how we got where we are. Achieving the structure of the company over the years, and now with more than 700 employees, has been gratifying. I made a couple of location selections that turned out to be bad choices. We did a food court in the Opryland Hotel in 2001-02, and it turned out we had five or six concepts, including Chick-fil-A. The court exceeded our projections by almost double. It did phenomenally well and was so different--in a good way--from how we read the location. I try not to look back. Five days a week, usually 10- to 12-hour days, plus travel to visit our locations. If I'm in town, I start my day with meetings and go to 5 or 5:30 p.m. My weeks get broken up by travel. I'm usually traveling every other week, doing lots of business development. We have business in 12 states, from New Hampshire to Daytona Beach. Golf, time at the beach. I read trade magazines, but for pleasure I love to read history, Civil War and World War II books. My father used to say, "Worry about things you can do something about and let the rest go." I want things done right. 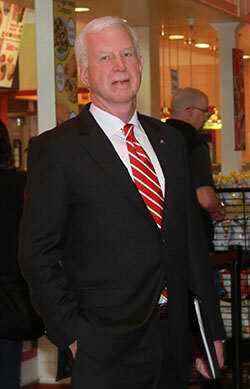 I want our personnel to look right, to treat our customers right, and to serve the best food. I'm a bit of a perfectionist. I work hard, but I have a condo near Destin, Florida, and when I can I go there and relax. I still use technology to stay in touch from there. Bill Gates. I like him personally, and I like the way he conducts business. Again, I am a little OCD about what the stores are doing and what they look like. I'm a combination of tough and easygoing. When I see things I like, I'm the nicest guy in the world. In my position, it's finding locations that work right for our company and meet our criteria. You have to do a lot of fishing and throwing them back before you catch the right one. They tell me I work too hard, that I'll never quit working. I have worked since I was 11 years old, and between working, the military, college, and this company, I've never stopped. I always try to improve what we do as a company. There's always room for improvement in how we do our jobs. I don't micromanage people. I'm a quiet manager as long as everything is okay. I give them a lot of rope to do what they want. If I see something that's a problem, I will get involved. I keep up by reading reports. If I see something I don't like or understand, I get the VP of operations up to talk about it. What are the two most important things you rely on from your franchisors? It's important that they keep our products fresh and on the cutting edge, and we depend on them to do inspections to ensure our personnel are preparing the food right. We need products to come in on time. We don't do much marketing because most of our locations are in what we call non-traditional environments, like airports and outlet malls. We don't go after people--they're generated to us. We don't use it much for the same reason we don't do much marketing. Some airports have websites, and it's helpful to see positive comments. Each location does its own hiring and firing. Each of our unit managers is trained by the franchise concepts they operate. Our operations team is constantly visiting the units and conducting staff training. Generally, communication is the best approach. If you deal with people out of respect, you can resolve most problems head-on. If someone doesn't do what they told me they would. We like to get one or two new locations each year. That's how we grow, although that's not always under our control because of the environments in which we work. We look at growth on two levels. First, did we add new units to our portfolio? Second, and just as important, we closely track same-unit sales against the previous year. Slowed down. In 5 years, I'd like to be involved in the day-to-day business, but in 10 I'd like a more passive role. The current economy is better than 2008 in every location we have. Now we're getting back to pre-2008 numbers. We right-sized where we needed to. When volume drops, we have to adjust our labor force. We're computerized and sophisticated in our labor and food cost management. We watch them constantly, daily. We do budgets and each year in November and December. We go to each location, get out our crystal ball, and do the best we can. Historically, we've used private investors. For 20 years, we've had a network of private investors we use. I have borrowed from local banks on a personal basis, but the majority of our funds come from our investors. We offer a comprehensive benefit package, including insurance, paid vacation, and retention bonuses. We also have a bonus system for all of our management team members. Our key people share in ownership, which is something you have to do to retain good people. It's a constant work in process, a constant challenge. We try to project ahead of ourselves and make adjustments as needed. Bonuses, monetary awards, and company-wide recognition. I realize that in the next few years I have to bring in someone younger who knows how I think and shares the same goals and objectives.